Amy's Creative Pursuits: You Take the Cake! Amy I love the polka dotted card and your paper piecing looks awesome..love that popped up cake too.. Your other card is so much fun and what a great image!!! Love them both!! Both cards are awesome Amy but my favorite is the black & white! Love all the dots & stripes as well as the dimension you've given it!! Awesome work! Take care! Love the MFT card. Black and white is one of my favs too. Especially with the polka dots. WOW! They are both fabulous in their own! 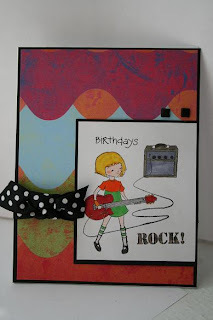 Love the polka dot dress...wonderful b/w card, and the rock star is perfectly funky! Black, white and pink are one of my favorite color combos. The rock star is such a fun card! I love the combo of the dotted and striped paper on the first card. How fun that the dress matched. Also cool how you popped up the cake. Great bday card. More irritated customers? Your town must hold the record for nasty people who craft based on your accounts of your work day!